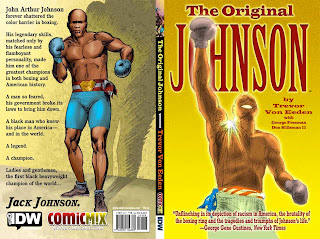 The graphic novel we recently released in tandem with ComicMix, Trevor Von Eeden's THE ORIGINAL JOHNSON, VOL. 1, received four nominations for TOJ, and five total. The Glyph Awards are designed to "recognize the best in comics made by, for, and about people of color from the preceding calendar year," have released the names of the comics and creators that make up their 2010 nominee slate. TOJ received four nominations, in the categories of Best Artist, Best Cover, Best Male Character, and Story Of The Year. "It's wonderful to see Trevor Von Eeden's life-work receive such recognition," ComicMix editor-in-chief Mike Gold said. 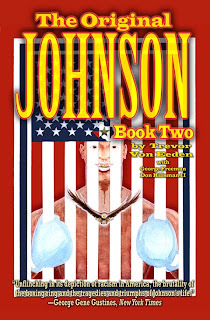 "He's been working on The Original Johnson for 15 years, and we've been working with him for the past three. It has taken an extraordinary amount of effort to produce this book, and recognition from the Glyph awards makes every drop of it worthwhile. We are proud to be associated with Trevor and this amazingly intense work. My personal thanks and gratitude to Trevor and to all of those who have been involved in the effort." The awards will be presented at the East Coast Black Age of Comics Convention in Philadelphia on May 14th and 15th. And if I can also stump for a book published by a competitor, it's great to see Josh Dysart's UNKNOWN SOLDIER comic, one of the best comics being published by someone else, also receive multiple nods. Congrats to all the nominees.